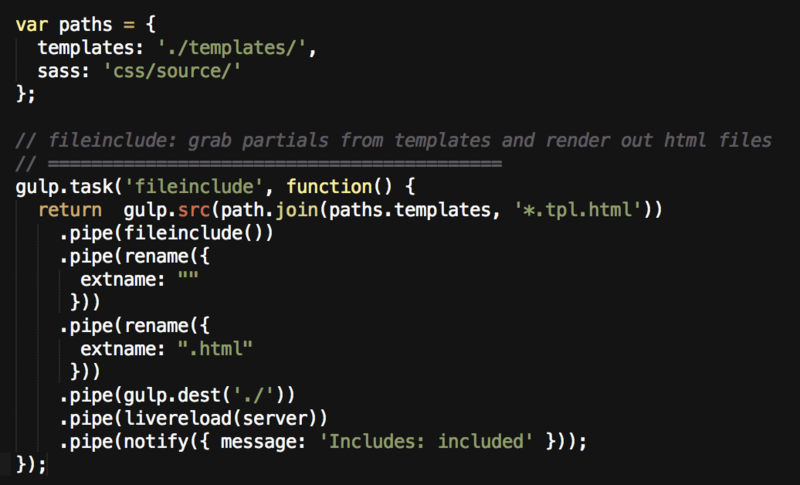 We have been using Gulp.js on a new project at work, and I’m now using it to power and build my own projects. I’m writing this article to help even non-technical people (I am a designer by schooling) understand Gulp. We are going to build a static site tool because I think the best way to learn is to build something useful. Why a static site tool? I tend to like static site generators because they are excellent for rapid prototyping, and I have been using them for my own website because I like that level of control. If you are like me, you may tend to get frustrated trying to reengineer or refit someone else’s system into your own. Also, I really don’t like meddling with an intermediary abstraction layer or admin interface (typical in a CMS like Wordpress), and I don’t need a database or other features many solutions provide. With that said, I don’t want to return to 1996 either. I want to leverage the power of my favorite stuff like Sass, Jade, or Markdown. Previously, I have used great tools like Middleman, StaticMatic, nanoc, and lately my current site was built with Ruhoh. Let me say right-away that there is nothing at all wrong with any of these tools. In fact, I strongly recommend considering them yourself. However, as I have wrapped my head around Gulp, I believe it may be the best fit for my needs, doing exactly what I need, and not a lot more. Our goal is to create a single gulp task that can do all of this at once. However, we need to create a task for each specific job first. Now, first I recommend establishing your paths (telling gulp where the files are) outside of your tasks so you can easily modify your file structure. I follow a simple naming convention for template files to keep me from confusing them with generated output files. Any file that has a .tpl in it maps directly to an output file with the same name, minus the .tpl. If I want an index.html file, then the template for it is in /templates/ and it is named index.tpl.html. Partial files follow the standard naming convention using an underscore like _nav.html. This first line names the task “fileinclude” so I can call this recipe later when I want it to execute. You can name a task whatever you want: e.g. coverMePorkins. However, I name tasks based on what core job they do, and in this case it happens to be the name of the core gulp plugin I intend to use. At the beginning of a gulpfile we have instructions on which plugins to use. Typically we store a plugin like gulp-file-include in an object simply called fileinclude. Therefore, this line of code asks the core gulp-file-include plugin to run and insert any partials in my template file. Huge shout-out to my design partner in crime Lauren for this bit. This uses a plugin called gulp-rename to strip off the .tpl from index.tpl.html. The first rename replaces the .html extension with nothing, then the second replaces the new extension (now .tpl) with .html. So now we have a file just called index.html with my html chunks inserted into it. Where do you want this new file? This uses gulp-livereload to tell my browser (which is running the Livereload extension) something changed and it should refresh now that the output file has been saved. This uses gulp-notify to inform me (This uses OSX’s notification center. If you are on a windows system you can use gulp-notify-growl.) that everything went down successfully. That task is complete. This uses a different collection of gulp plugins, but works in exactly the same manner. The core plugin for compiling Sass is gulp-sass (which uses Libsass), and you may note we pass it a couple of formatting options (e.g. style: ‘expanded’). The plugin gulp-autoprefixer totally pwns browser prefixing so I don’t have to worry about that in my Sass files. The task outputs into my /css directory, tells the browser to reload, and again, messages me that it worked. Port 1337…really? What kind of dorky nerd…oh yeah. We are talking about programming. nm. I can pass in different tasks to this watch function. 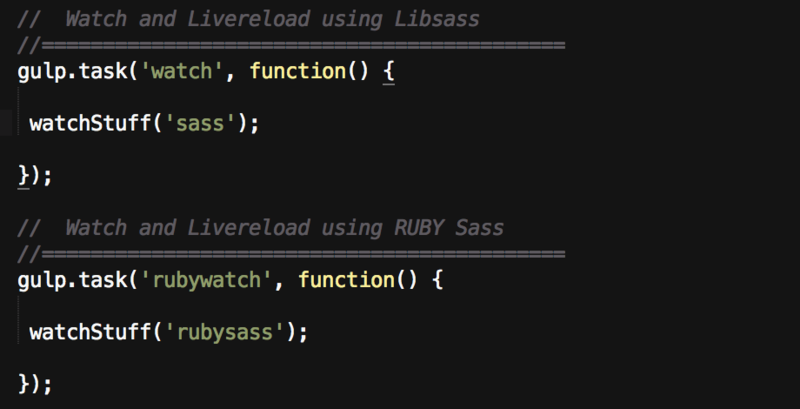 One uses Ruby Sass, one uses Libsass. First I name the function and give it a way to pass in the Sass compile task I want. Then server refers to a node plugin for live reload called tiny-lr. We tell server what port to listen on (35729 is the Livereload default) and allow for errors to be reported to the console. What do you want me to watch? What do you want me to do when I see something happen? First I watch my Sass directory for any changes to files that end with .scss. When detected — we run the [task] that is passed into the function (Libsass or Ruby Sass). The second watch listens for changes to files in my templates directory, and runs the fileinclude task we wrote at the beginning when it detects a change. Note that I am not doing anything in my watch function but running other tasks. In the spirit of one tool for one job, I like to keep my functions and tasks fairly focused. Lastly, we need to create two other tasks that tell my watchStuff function which Sass compile task I want my to use. My default task is Libsass because I would like to use it as soon as it is updated. My alternate uses Ruby Sass. The first task, just called watch runs the watchStuff function and passes in the Sass task we wrote above. The rubywatch runs another similar task (I haven’t shown here) that simply uses a different Sass compiler. All of these tasks are great, but as I said in the beginning, we really don’t want to have to run each of them separately every time we want something done. Let’s create a master task to kick off our other tasks for us. Default to the most common and most useful collection of tasks. It is always a good idea to have a default gulp task. This is the task which runs by simply entering gulp without any taskname. I set my most commonly used tasks as my default. Therefore, I start by running the fileinclude task first to make sure the latest html changes are rendered. Next I do the same with my Sass files. After that I start up my preview server at http://localhost:1337 with connect. Finally I kick off my default watch which will start Livereload and continue to automatically run my fileinclude and sass tasks. And with that, we have basically all the things that I use on a day to day basis to build stuff quickly and efficiently. As you might have guessed, there are many more things that Gulp can do. (I mentioned Jade before, and you can easily write a task to wrangle jade files) I’m certainly no expert, so this has been a fun learning experience for me as well. As a tool, I am continually adding and refactoring my gulpfile (feel free to view/steal what I currently have in this gist. ) to do more things. At some point I intend to create a tiny vanilla package out of this tool that can help me and others quickly get a site up and running. I can say I have been impressed with how simply I (designer, remember…) can get Gulp to do what I want. The code is not obscure or arcane and I love that I can easily write tasks to do exactly the jobs I need. I think it is worth your time to give it a shot. If you run into problems, or have ideas and suggestions, drop me a line. I would love to hear other people’s experiences using Gulp.